Tragedy struck on Wednesday as five people, including three secondary school Principals, one Account Clerk and a driver died in a motor accident along Oyo-Ogbomoso Road, in Oyo state. Seven others were seriously injured in the accident involving a truck and the bus in which the victims were traveling. Sources told newsmen on Thursday that the victims were returning to Ogbomoso from Oliveth High School, Oyo State, where they attended a workshop. According to sources, one of the deceased principals, identified as Mr. Ogunremi, was due to retire next week Friday, before he met his untimely death. It was gathered that the accident occurred when a reckless truck driver was trying to dodge a pothole along the road and it reportedly veered off its lane and crushed the vehicle the victims were traveling back to their base. “While Ogunremi, two other principals and the driver died immediately, the account clerk, identified as Mr. Ajao, died in the hospital where they were rushed to”, one of the sources added. Those injured in the crash were presently receiving medical treatment at the BOWEN University Teaching Hospital, Ogbomoso. 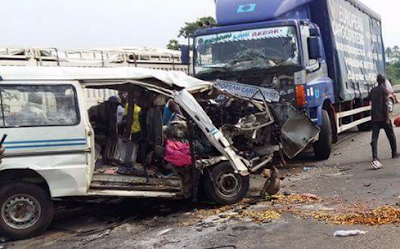 When contacted, the Deputy Route Commander, Federal Road Safety Corps, Oyo State Sector Command, Oluwaseun Onijala said only three people died, while 12 others sustained various degrees of injuries.